Call it burial insurance, final expense insurance, or end of life planning. Whatever the name, it is one of the most responsible lines of coverage an agent can bring to a client or prospective client. Now, with our special “Up-And-Running” sales training program, you can quickly begin helping the 13 million households nationwide that need funds to make this inevitable purchase. And with an enormous baby-boomer generation flooding the market, your professional assistance in burial insurance has never been more urgent, appreciated, and potentially lucrative. Burial insurance or final expense insurance selling is a traditional and often conservative marketplace. The sales cycle is equally traditional. You set the appointment over the phone or, as our more successful agents do, right at the door using the direct approach. After establishing the relationship (breaking the ice) you determine what the prospect had in mind when they sent in the lead card. Your presentation may begin with a brief video, or you may choose to go right in to the explanation and flip chart. Here you determine your prospects’ health status (insurability) and make sure your recommendations are both suitable and affordable. You then complete the application and, if a time-of-application interview is required, call the interviewer. Your final step will allow you to earn twice the income without working twice as hard. I’m talking about getting referrals. In the burial insurance marketplace, people are especially fond of the relationships they have with others in their age group. If they feel you have helped them, they will want you to help their friends and relations as well. Please honor their wishes by getting referrals. This is also where future annuity sales come from. 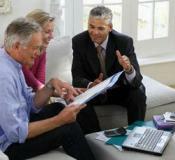 Getting started in burial insurance sales is quick, easy, and painless. Your first step prior to contracting with our national carriers is to get acquainted with Dignity Planning. This excellent pre-planning tool offered by the Dignity Memorial Provider Network helps your clients, step by step, with one of the most caring decisions they can make… end of life planning. Please watch the five-minute Dignity Planning video (excellent sales tool) here. Then return to this screen. View a sample of the client brochure "Plan for Tomorrow... Live for Today" (excellent sales tool) here. Visit the Client/Member website for those considering the purchase of burial insurance (excellent sales tool). Your entry into the final expense insurance market begins with a series of six quick training modules, including your agreement to represent our program in an honest and reputable manner. After watching the Dignity Planning video, fill out the form below to register (create a user name and password of your choice) and begin the six modules. Once you have finished the modules and clicked on the “Submit” button, we will contact you for contracting with our insurance carriers. For questions about the registration process, go here. P.S. Remember, your initial business plan is to use the urgent, lucrative and inevitable burial insurance market to grow your book of business. This alone can make you a substantial income. Phase two of your business plan is to call back on your loyal and appreciative clients to discuss their retirement plans and discover how fixed annuities can improve their quality of life even more.